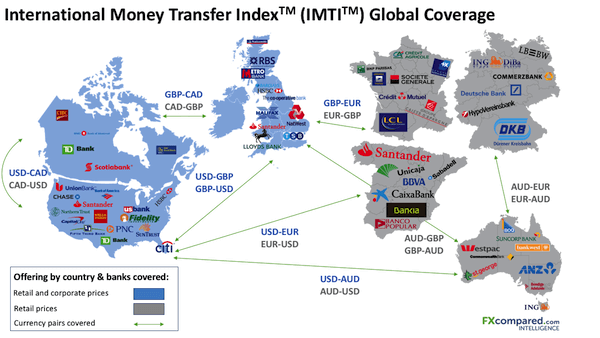 FXCintel’s International Money Index, provides users with pricing data of international bank-to-bank money transfers from across the globe, including banks based in the United States, the United Kingdom, Germany, France and Australia. IMTI is most often utilized by those in the international payments industry, including banks, international money transfer companies, corporates, consultancies or any individual seeking to better understand the international payments space. FXCintel surveys several major banks from each country.